Sometimes, the most unassuming clients are the most passionate, and this is unqualifiedly true for Amelia Parker, a lifelong animal care volunteer specialist who is seeking to return to full-time work to capitalize on her extensive volunteer work. By way of background, Amelia loves rabbits. She owns several, some of which are house trained and some of which live in an enclosure on her property. 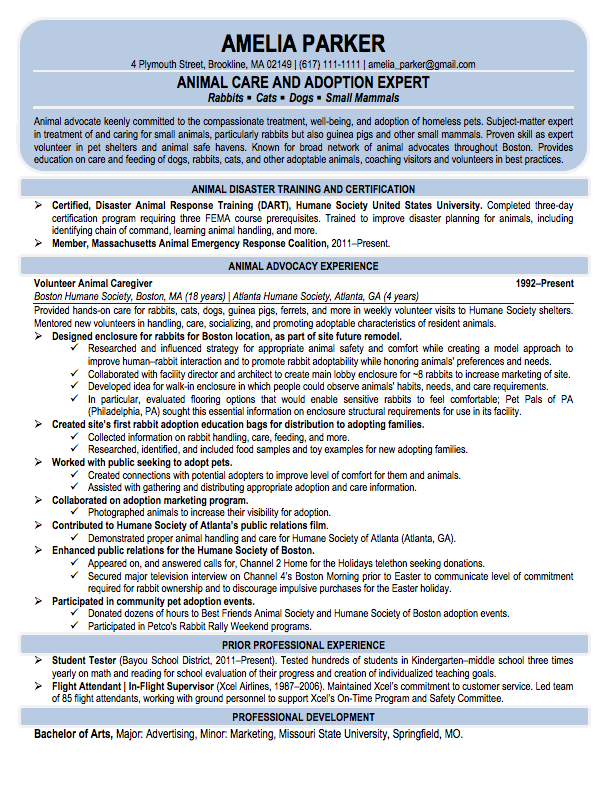 To fulfill her personal mission to elevate rabbit care, she regularly volunteered with the Humane Society in two locations to serve mostly small animals for more than 20 years, during which she participated in decisions critical to the facilities’ evolution of rabbit care strategies, as the résumé details. Now she seeks to work professionally to build on her extensive volunteer roles. In completing Amelia’s career portfolio for her return to the paid work force, I truly had to understand the woman’s beliefs, attitudes, home life, and personal goals. Although these assets might not compare with those of a 25-year corporate veteran, they create, in their understated way, a powerful picture of Amelia’s mission and passion for her second career. Therefore, the minimalist design and one-page approach is an effort to match her calm, caring, and trustworthy demeanor with the power of the knowledge and expertise she will bring to her future role as a small animal adoption specialist. This résumé was nominated for Best Career Re-entry Résumé in the TORI competition of 2013.